Imagine at the age of 23 already being established in your career only to experience something that causes a change in plans and change in career trajectory. In July 2017, Bryan Blackwell changed plans, leaving Atlanta, GA to return to Bowling Green to earn a Master of Arts in Education focusing on Counseling and Student Affairs in Higher Education along with a Career Services certificate. While in Atlanta, Blackwell had an occurrence with a rare illness followed by his mother having three strokes and a heart attack. Blackwell talked to Professor and Student Affairs Program Coordinator Dr. Aaron Hughey, Associate Professor Dr. Monica Burke, and alums of the Student Affairs program before applying. After working swiftly to complete graduate school application materials, Blackwell was accepted and started in the program in August 2017. In addition, with the departure of a graduate assistant in the Downing Student Union, Blackwell began a graduate assistant position on August 1, 2017 to help cover his tuition and provide a monthly stipend. “My goal was to graduate in fall 2018,” Blackwell said. Since August 2017, Blackwell has taken a full load of courses each semester plus courses during the winter and summer term in order to meet his goal. According to WKU’s Student Affairs website, the program is committed to fostering student professional development, providing in-service training, delivering highly interactive application based courses, and more. The program structure and support allowed Blackwell to continue to gain experience as an intern for WKU’s Housing and Residence Life and Norfolk State University while earning his degree from WKU. 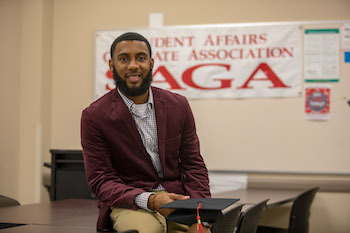 “Bryan is a very dedicated, passionate student who is concerned with more than just finishing a degree program; he genuinely wants to help others be successful, which is at the heart of what student affairs is all about,” Hughey said. Blackwell is receiving his Master’s degree with the goal of working in Student Conduct. One might question how the certificate in Career Services ties into that field, and Blackwell provides an interesting take on his desired approach. Blackwell says his Bachelor’s degree in psychology helps him understand the importance of identifying the why behind problems. “If you don’t understand the why, how can you help with the solution,” he said. Blackwell hopes to address conduct issues by learning more about what led to the issue, and then showing students another path. For Blackwell, a change of direction involves developing a plan to turn around your life. He wants them to know they do not have to quit. “I had plenty of opportunities to give up, and give up for all the right reasons,” Blackwell said. Bryan Blackwell was born with the rare illness (which led to moving back to Bowling Green), but he did not learn about it until the age of 18 during his first year in college. He was hospitalized for 21 days and lost his scholarship. From 2010-2017, Blackwell had 21 surgeries due to the illness. Despite the health issues, Blackwell managed to join Kappa Alpha Psi Fraternity, Inc., participate in three internships with the USDA, CDC, and state capitol, and graduate in four years. It is for this reason that Blackwell believes in the importance of helping college students see opportunities to change directions. “I still had my vision, but like I tell students, when you have a plan, you can still divert a little bit, but make sure you get back on track,” Blackwell said. Blackwell will participate in WKU’s College Recognition Ceremonies on Saturday, December 15, 2018 for the College of Education & Behavioral Sciences at 3:30pm. For more information about the Counseling and Student Affairs program at WKU, visit www.wku.edu/csa. Those interested in Student Affairs, can contact Dr. Aaron Hughey at aaron.hughey@wku.edu.